GT Galvanotechna Jablonec nad Nisou, surface-finishing specialist, is a service galvanization plant with option of engaging any type of sudatory, according to customers' needs. Contact us, and we will provide you with your desired surface-finishing. Division 1 (Located in Jablonec nad Nisou) does mainly precious metal galvanization for the jewellery and the electrical industries. There are, of course, other treatments of metal deposits like e.g. chemical dyeing and subsequent (dissolving and/or cataphoretic) varnishing. Our standard offer represents: gold, silver, rhodium, ruthenium plating, (acid and/or cyanid) copper coating, brass plating, chemical Ms and Cu polishing, nickel coating, antique retouch, electrophoretic coating, hard coal, tinning and palladium coating. Division 2 (located in Proseč nad Nisou) does mainly galvanic zinc coating using sub-acid and/or cyanid-free alkaline electrolites in a hung or in a mass way. We keep in our zincing disposition chromatizing immunizing bathes Cr6+‚ Cr3+. We are able to arrange blue, yellow and black chromatizing and/or biue and high-build coating immunization (with the possibility of subsequent coloration in yellow) if requested. Moreover, we offer hung and/or mass zincing, chemical nickel, tin coating, cyanid copper coating and brass plating in mass way. 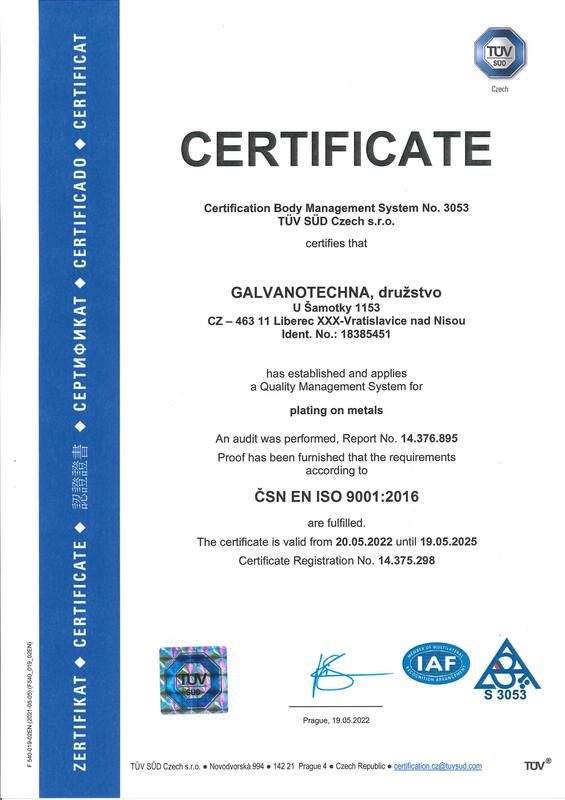 We are able to make parts of soud steel hydrogen-free after galvanic treatment if requested. A part of our standard offer is also blacking treatment of standard and stainless steel. We did also metal coating of plastics in our automat line till the middle of 2007. Now, we are looking for a new project and/or order. We keep In our disposition bathes or the following measures: The length of 2,20 m, the working height of 1,20 m and the usable width of 25cm. Galvanotechna, a Co-Operative Society, Is a private firm with the annual turnover about 2 millions Euros. We have our own sewerage water preparing plant and we hold all needed licences and Government concessions required for our business activity. 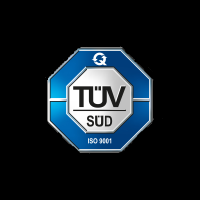 Our firm has passed the ISO 9001 process and has been certificated.